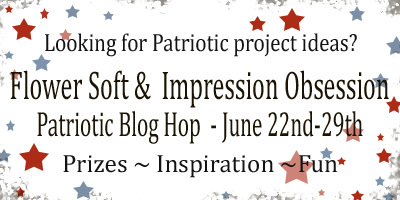 The Impression Obsession designers are teaming up with the Flower Soft team for a fun patriotic hop! Hope you'll join us! If you're here because you're a regular reader of my blog and you'd like to view the entire hop, head over to the Flower Soft Blog to get started. If you're already hopping and you've come here from Jeanne's blog, you're doing just fine! Make sure you leave comments on as many blogs as possible for a better chance at winning prizes!! 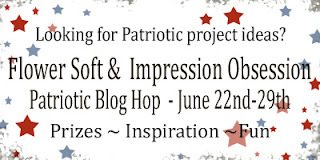 One random commenter will be chosen to receive a $25.00 Impression Obsession gift certificate, and another commenter will be chosen to receive a $25.00 Flower Soft gift certificate. So many Impression Obsession images are a perfect match for Flower Soft, especially the sentimental scenes. I went a little different route, and chose a favorite image (Candy Jars) that is so fun to customize for different occasions (Halloween was especially fun!). ... and here's a close-up on that fun Flower Soft! I love the slight transparency of the Polar White - the blue shows through just enough. And ooh, that sparkly red! So fun. Ready to hop on? Your next stop is Cibele's blog, Flower Foot Designs. Hope you enjoy the hop! P.S. Here's a full list of everyone involved in the hop today, in case you get lost or hit a hiccup in the line. It happens! 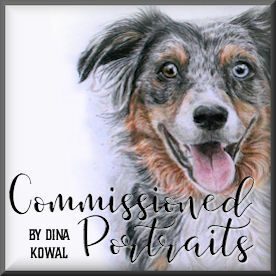 Dina Kowal --------- You're HERE!! Stunning card, Dina! Absolutely gorgeous coloring, and detail! What a FANTASTIC creation. I LOVE candy shop stamps...and the flowersoft just gives it that wonderful pop! Great theme colors. Very festive. Love it! Super card, I really like this candy jar stamp(s)! The flower soft really makes it pop. OMG what a great idea for a patriotic card, I love it. Finally I have some ideas to use my flower soft and a reason to buy more colors LOL. Wow, Dina, this is awesome. I love it. This is amazing I have got to get this stamp. Love the coloring!! Gorgeous card! This is AWESOME! What a perfect way to use the flower soft to add texture! LOVE this! Wow! I love your card! That candy jar stamp is awesome! Oh that rock candy looks awesome with the flower soft! Gorgeous design! Love love love your candy jars, and so do my kids! I would have never thought of this theme, but your card is absolutely perfect, with beautiful colors and coloring, and oh so yummy! what a fun card - love the rock candy! WOW! This is amazing! I love the added texture from the flower soft and the fun colors! So yummy! Love the rock candy sticks. Yikes, this is so cute! Love how you made those sugar sticks so dimensional with the Flower Soft. Clever and imaginative! Wow! I can't believe that is the Flower Soft on those candy crystal rock stick things! You did an amazing job! The whole card is just too sweet! Love it! Super fun card, LOVE the rock candy sticks! So creative and clever. WOW!Gorgeous card!Love the coloring,stamps,everything is AWESOME!!! Fun card! Candy Jars is a favorite design of mine also.... so fun to do in different colors for different occasions! The added Flower Soft looks great on it! Great card! Love how you used the flower soft on the candy! Love the red, white and blue coloring of this stamp! Great job! Thank you for sharing. This is a really striking card, Dinah. And I really appreciate your thoughts regarding the way colors can change up a single image. So true. Very cool card! I always think of FS for, well, flowers, but love it as candy on this super fun image! Yum! Not only are those candies too cute the colors you used are the best! Totally blown away with your card. Colouring and design is amazing and love the added touch of twine. Love, love the colors! 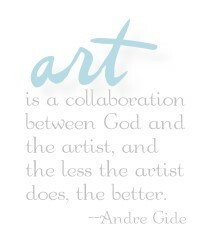 You have an amazing talent--thanks for sharing! The jar looks so real I want to tap on the glass! I love the way you used flower soft on the rock candy! It makes me want to take a lick. Thanks for sharing! Makes me feel like I am in the candy store. What a cute and clever card...I LOVE it!!! Yum! What a fabulous design using reds and blues. Perfect for summer and the Fourth of July! Wouldn't it be fun to decorate a Fourth of July with all these candy jars. Delight and sweetness to my eyes and soul, Dina! Dina, as always a wonderful card. What a creative use of the flower soft. Stunning card. I am in the presence of an artistic genius! (Bows low...) Fantastic job. 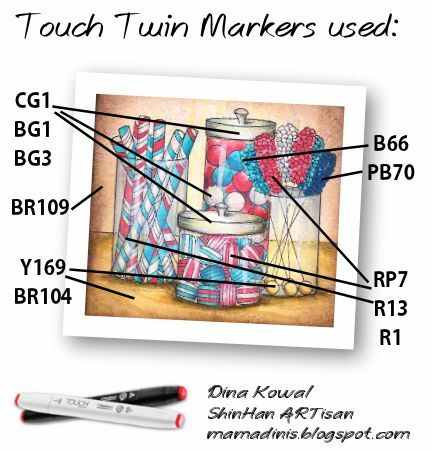 Love the texturing that you colored on the gum or candy balls in the tall jar! And your coloring of the jars and contents is spot-on perfect. Amazing. Thanks for sharing this with us. I am truly in awe. HOLY COW!!! It must've taken a long time to color all the "goodies." Looks yummy!!! Love the candy... The rock crystal candy looks so good with the flower soft on it. Amazing..
Way awesome card! I love how you used the Flower Soft to make the candy pop. I may have missed the hop day; but not the project inspiration! Still hopping along. Love your card, fantastic details! Thanks for sharing your time and talent with the blogger world! I like all the colorful candy! This has to be the cutest card ever!! Love the addition of the Flower Soft to the candy! Such a beautiful card! I love how colorful it is! OMGosh, this is amazing! Love the colors and the use of flower soft. I really want some hard candy now. Amazing work. Your red, white and blues are so pretty. Such great coloring! The card layouts are wonderful too.